Hip fractures are among the most common types of broken bones, and once over the age of 65, a broken hip is the most common reason why people need fracture surgery. Unfortunately, this difficult problem often affects the most vulnerable and frail patients. While some common orthopedic injuries occur in more vigorous, active individuals, the majority of broken hips occur in more sedentary, frail people. Because of this, many people who sustain these injuries, or their families, are concerned about the recovery process. Is a major surgery worthwhile? What are the chances for recovery? What is the best way to help an elderly person who has broken their hip? Almost all people who break their hip will require a surgery to fix the problem. There are different treatment options that depend on the location of the fractured bone and the patient who is injured. The options essentially are to either repair the broken bone, or to replace all or part of the hip joint. Most fractures will have a preferred method of treatment, although in some situations your surgeon will make a recommendation where there may be more than one option for treatment. It may cause more problems. Being immobile can lead to a number of problems with people. The development of other medical conditions is one of the major problems with nonsurgical treatment of hip fractures. Immobile people are prone to developing pneumonia, blood clots, and bed sores. These conditions are already issues for older people, and if you can't move someone, then the chance of developing one of these types of problems goes up significantly. For these reasons, even in very frail or very sick patients, repair of a hip fracture is typically recommended. It can be difficult to care for people. Taking care of someone who can't move is very challenging. Simple tasks such as bathing and toileting someone who cannot move is difficult. While managing painful symptoms of a broken hip can be accomplished by having someone lie still, it is not reasonable to care for someone without moving them. Therefore, even when broken hips occur in people who are entirely dependent on others for support, they are typically repaired surgically to allow for this care to take place. The surgical procedure used to repair a broken hip may vary depending on a number of factors. In general, fractures of the very top of the thigh bone, called the femoral neck, are treated with replacement. If the femoral neck fracture is not at all displaced (out of position), then a repair of the break may be considered. Fractures below the neck of the femur, called intertrochanteric or peritrochanteric fractures, are treated with surgical repair using rods, plates, or screws. As stated, the ideal way to fix a particular fracture may vary depending on the fracture pattern, surgeon preference, and the particular patient being treated. 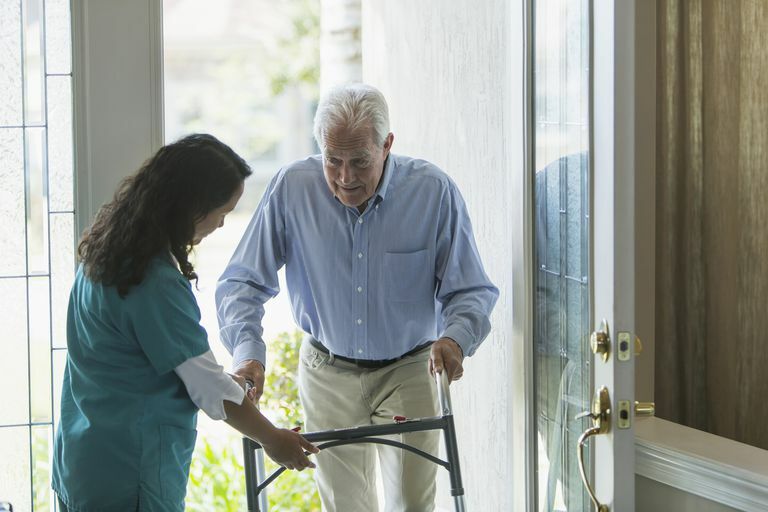 The best way to recover from a hip fracture is to get moving as soon as possible. Immobility opens the door to the possibility of significant complications. For the reasons listed above (preventing pneumonia, blood clot, bed sores, etc. ), it is critical to get patients up and moving as soon as possible after surgery. There are a number of ways to help accomplish this goal. Most importantly, the surgery should be performed soon after the injury. There is controversy about how soon the surgery should be preformed, but ideally within 48 hours of the injury, and possibly sooner. Many hospitals are getting better equipped at getting these individuals with broken hips to an operating room on either the day of or the day after their injury. There are situations where surgery has to be delayed, such as when there are other major medical issues that need to be addressed prior to a surgical procedure. Another common situation is when an individual on blood thinning medication breaks their hip. The blood thinning effects may need to be reversed prior to safely performing surgery. The second step is to quickly get up and moving after the surgery. In the hours and days after surgery, the nursing staff and therapists will be working to get people up and moving. Even changing position and sitting up in a chair can help to prevent some of the complications that can occur in people with broken hips. Unfortunately, full recovery after a broken hip occurs in only about half of all people. The other half will have a decline in the function when compared to their pre-injury activity level. Sadly, almost one quarter of people who break a hip don't live for a full year after their injury. While this group tends to represent the most frail people who break a hip, it is a startlingly large number. Mobility: In order for joints to function properly, they need to move. A joint that is frozen in space may have good muscle tissue surrounding the joint, but without proper movement those muscles cannot function properly. Mobility can be impaired by fracture healing, deformity, implanted hardware, and scar tissue formation. Strength: Restoration of muscle strength is critical after breaking ones hip. Unlike a hip replacement surgery recovery, where the muscle damage is minimal, the trauma of breaking a hip bone also damages muscle function significantly. In order to regain muscle function, it is critical to get the muscles working as soon as possible after surgery to prevent potentially permanent atrophy of the muscle tissue. Balance: Recovery of balance is critical not only to regain function but also to prevent the potential for further injury. Balance is critical to activity, and a decline in function is often the result of a loss of balance. Use of ambulatory aids (canes or walker) can be helpful, but regaining proprioception and balance can help restore activity. Full healing of a broken hip can take many months. Most fractures take 10-12 weeks for healing, and the muscle strength and mobility can take much longer. Typically, people get close to their full recovery within 6 months of the injury, but it can take up to a full year to achieve as much improvement as possible. That said, people who sustain a hip fracture should not wait for months or longer to be aggressive with their therapy. As time passes, the likelihood of regaining function steadily declines—the strongest gains are made early in the recovery process. On a positive note, many people who sustained a hip fracture do recover their preinjury level of activity, and are able to return to their normal activities. Unfortunately, not everyone is able to make that type of recovery. Most people think of aging as a steady, gradual decline in function. The reality is, much more commonly as people age they experience long periods of steady functional activity, with intermittent sharp declines in function. A hip fracture can be an event that initiates a sharp decline. Hip fractures are serious injuries, and while full recovery is possible, it is not always achieved. In fact, about half of people who sustain a broken hip will have an overall decline in function even when their bone is fully healed. For that reason, timely surgery, early rehabilitation, and patience for a long recovery are important, and hopefully you or your loved one will be able to get back to all of the activities you enjoy! Mounasamy V, Guy P, Kates SL. "AAOS Appropriate Use Criteria: Treatment of Hip Fractures in the Elderly" J Am Acad Orthop Surg. 2017 May;25(5):e105-e108. Quinn RH, Mooar PA, Murray JN, Pezold R, Sevarino KS. "Treatment of Hip Fractures in the Elderly" J Am Acad Orthop Surg. 2017 May;25(5):e102-e104. Quinn RH, Mooar PA, Murray JN, Pezold R, Sevarino KS. "Postoperative Rehabilitation of Low Energy Hip Fractures in the Elderly" J Am Acad Orthop Surg. 2017 Jan;25(1):e11-e14. How Are Acetabular Fractures Treated? What Happens When a Broken Bone Doesn't Heal Properly? Are Intramedullary Rods Effective for All Fractures? What Does It Mean When a Broken Bone Penetrates the Skin?